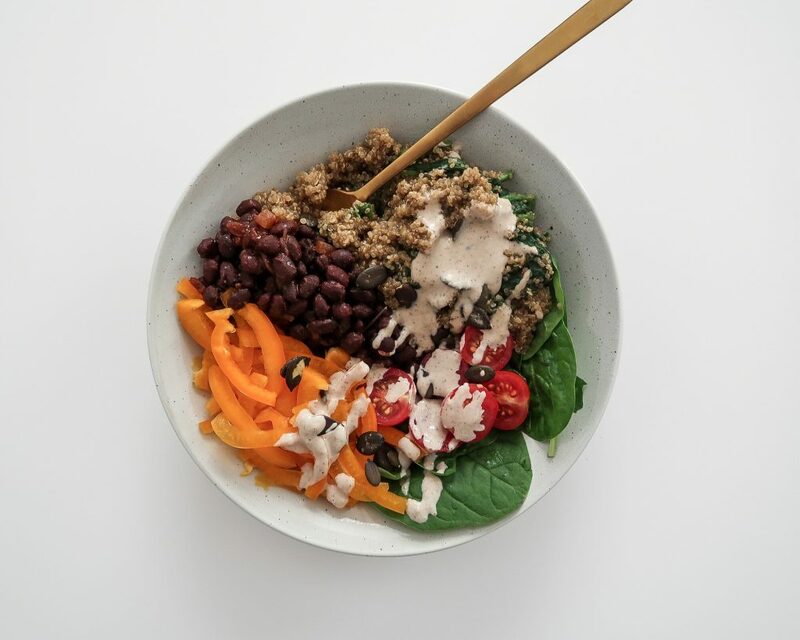 This quinoa and black bean buddha bowl is packed with iron and other healthy nutrients to nourish your soul and body. Eating flavorful wholesome meals just makes me feel so much better and energized afterwards. Plus, iron is such an essential nutrient for us and there are plenty of plant sources. I hope you enjoy this recipe! Essentially, iron is the key component of myoglobin and hemoglobin (the red blood pigment). These two proteins store and transport oxygen through our body and to our muscles. Without iron, we wouldn't have the constant supply of energy we need. You can get iron from both plants and animal sources. Iron from plant sources is a little bit different since it has a lower absorption rate. This means you need to eat more iron for your body to receive the same amounts. It is recommended that vegetarians and vegans consume about 1.8 times the amount of what is recommended as daily iron intake. 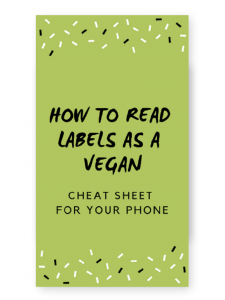 You can read all about iron and how to get enough on a plant-based diet in my blog post "Iron on a Vegan Diet – How to Get Enough". 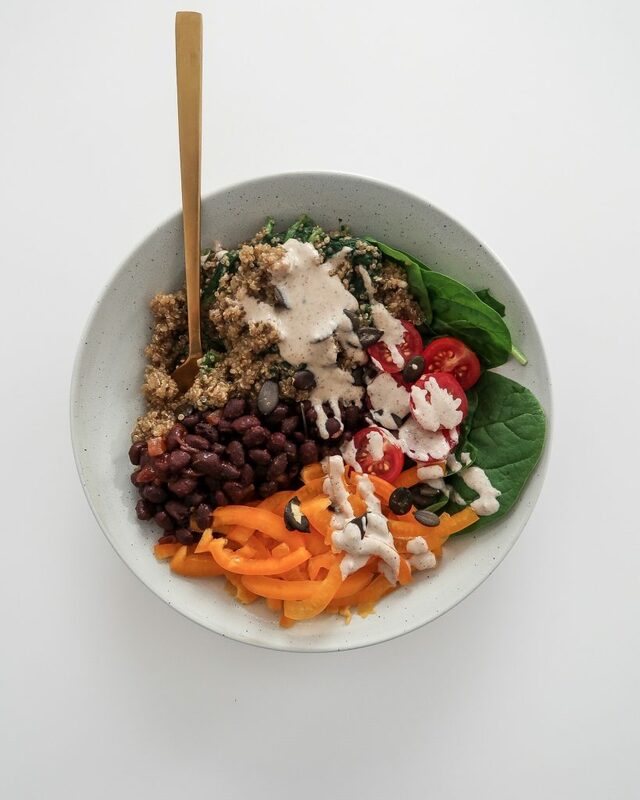 This quinoa and black bean buddha bowl has 11 mg of iron! 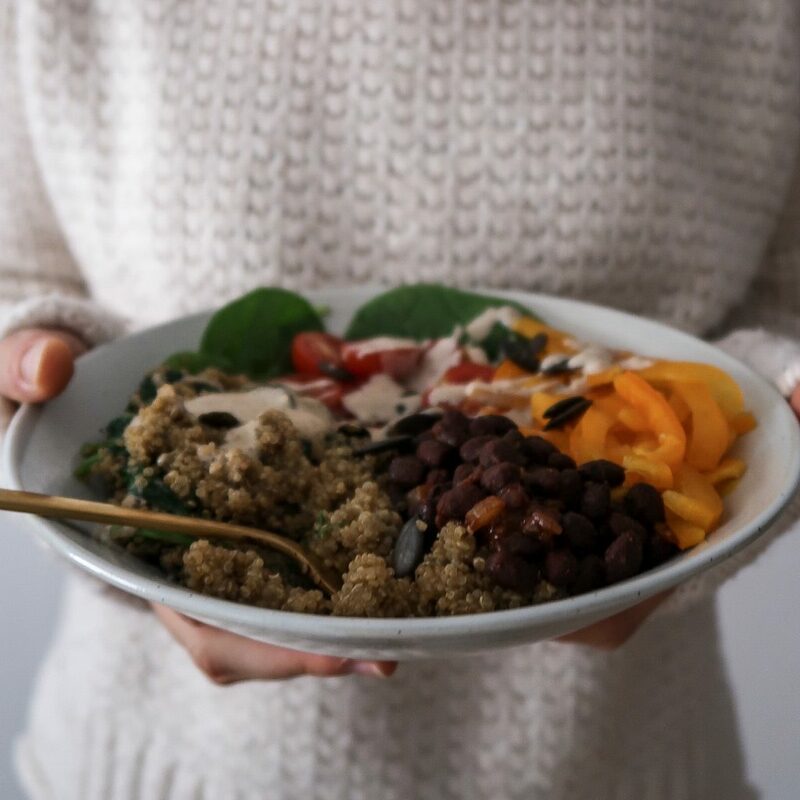 It comes mainly from the quinoa and black beans which are both good sources of plant-based iron. The vegetables and lemon juice provide some vitamin C. Vitamin C is important because it increases the absorption rate of plant-based iron. quinoa: 100 g of cooked quinoa have 1.5 mg of iron. black beans: 100 g of cooked black beans have 2.1 mg of iron. tomato puree: Tomatoes are great because they not only have iron but also vitamin C which helps absorb the iron. tahini: 25 g of tahini have 2.2 mg of iron. pumpkin seeds: 25 g of pumpkin seeds have 2.2 mg of iron. lemon juice: It is recommended to drink a glass of orange juice with your meals or add lemon juice as a source of vitamin C. Especially since plant-based iron has a lower absorption rate per se, this is a simple tip to increase iron absorption. Have you ever gone to a restaurant, ordered a delicious looking plate and it was just full of flavors? And everything tasted a little different and even the tiny drizzle of dressing created an explosion of flavors in your mouth? I always wanted to recreate this at home but before, I've struggled. 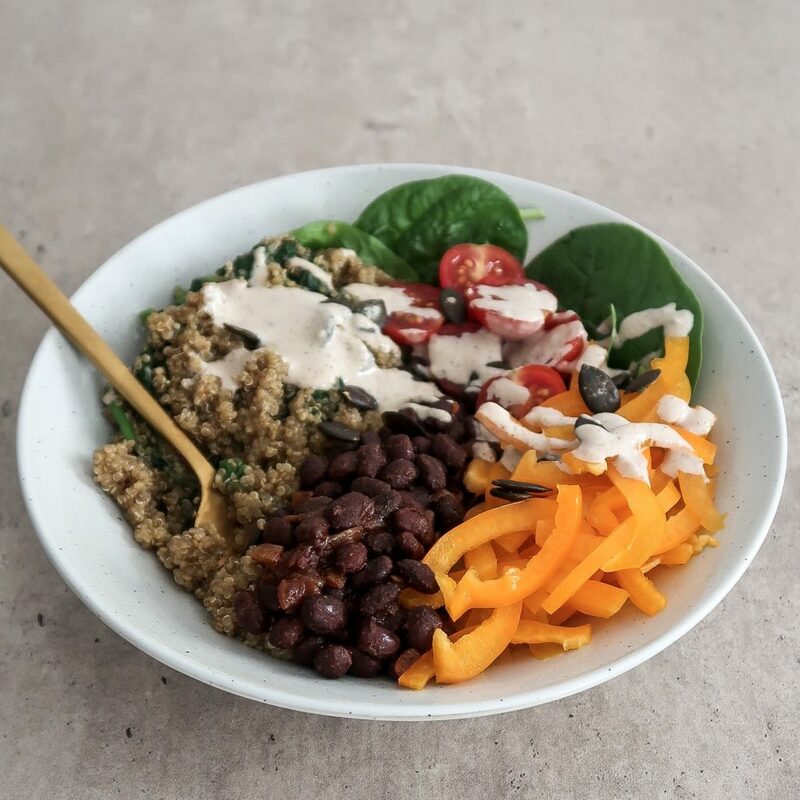 But let me tell you, this quinoa and black bean buddha bowl is bursting with flavor! Cooking the quinoa in vegetable broth is such a game changer and takes your quinoa to a whole new level. Also, the tomato puree and combination of cumin, cayenne and paprika fits so well with the black beans. And the tahini sauce adds a nice finish on top with a little bit of sweetness. Start by cooking the quinoa for ~ 15 minutes, stirring occasionally. If you don’t have vegetable broth, simply mix 200 ml of water with a teaspoon of vegetable broth powder or a vegetable broth cube. While the quinoa is cooking, make the sauce. Mix all the ingredients until well incorporated. Finely dice the onion and sauté in a splash of water in a pan over medium-high heat for ~5 minutes. Strain the black beans. Then, add the tomato puree, black beans and spices to the pan and let simmer for another 5 minutes, stirring occasionally. Wash the vegetables. Cut the bell pepper into thin strips and the tomatoes into halves. If you want, you can mix half of the spinach with the quinoa. 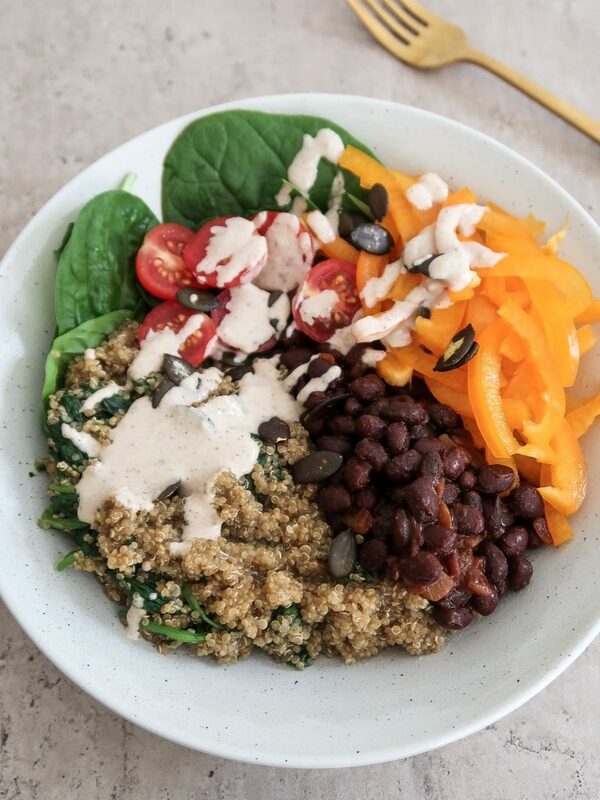 Assemble your bowl by first adding the spinach leaves, then the quinoa, black beans and vegetables. Drizzle the tahini sauce on top. Garnish with a few pumpkin seeds. 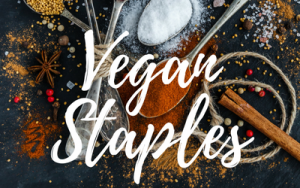 You could also use maple syrup or another liquid sweetener of your choice instead of agave.